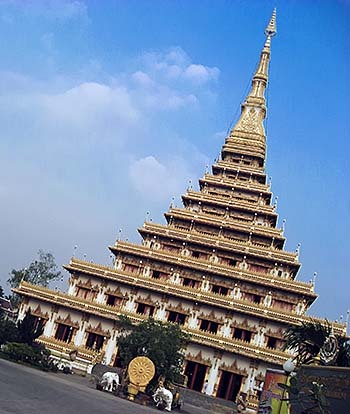 Khon Kaen is one of the four big cities on the Khorat Plateau (Isan). A place with little history, swollen due to a railroad connection in the early 20th century, it's a commercial center and traffic hub for the wider region. It's also a center for what's called 'education' in this part of the world. 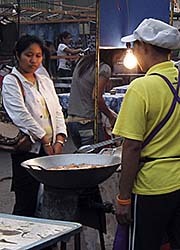 Khon Kaen City is as well the provincial capital of Khon Kaen Province. Since Khon Kaeng has not much of a history, it's mostly a modern city monster. When the small Thai towns are already incredibly ugly, you can rely on one thing: as bigger, as uglier. Khon Kaen made it to a really bad one. It swoll up since the railway line from Bangkok connected it to central Thailand in 1933. It grew cancerlike since the 1960s initiated by big American investment. The railway line was built then up to Nong Khai; nowadays it's crossing the Mekong River and continuing in Laos to Vientiane. Thai/Chinese traffic plans foresee to connect Vientiane by rail to China, and to expand the railway massively to a high-speed line. Disappointing as the place is, with it's still ongoing building boom and a cursed real-estate bubble, it's actually not much worth to be visited except only for convincing oneself on how bad it is. More disappointing I personally found the object of my longings, the National Museum, being closed on that Monday (and the following Tuesday), on which I arrived. The guard let me stroll around in the museum's garden, where a few stone circles of probably mostly Dvaravati tablets are (re-)placed. The lazy dogs there where, exceptionally, no trouble as they are usually. 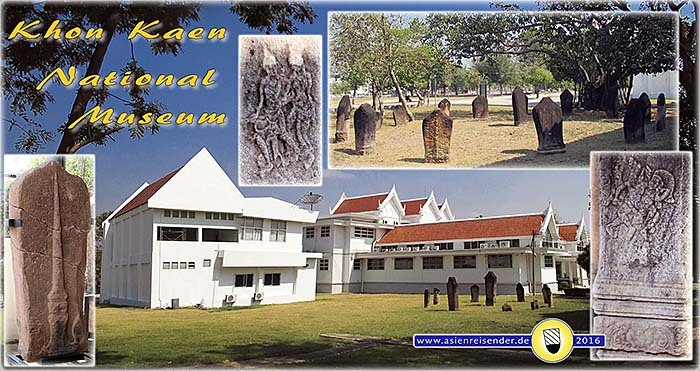 I would have been curious of the artefacts from Ban Chiang Archaeological Site which they have there, and their stone-age man skeleton. The museum charges, by the way, as normal 100 baht from foreigners, 20 baht from Thais. 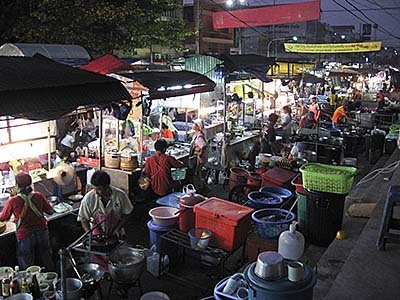 As a center of education, the city has a large campus university, what is Rajamangala University, with a student population of 25,000 or more. By the way, the Chi River is passing through the province. Khon Kaen has also a consulat of the Lao People's Democratic Republic for those who need a Laotion visa in advance. 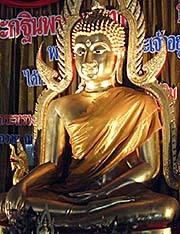 In the province are traces of pre-historical settlements around Chum Phae. Also the medieval Dvaravati Culture is present at Nong Mueang. Dvaravati was ousted by the military machine of the Khmer empire which controlled the area for a time as a remote province. The town itself was founded in (the revolutionary year) 1789 as Ban Bueng Bon as a colony of the empire of Champasak. However, this place was located about 30km away from it's contemporary location. Soon it turned from Champasak to Siam, which offered better conditions for a vassalage. However, it remained an unimportant Siamese outpost until the railway line was established. Allegedly, the town moved it's location alltogether six times until ending up in 1879 where it is now. 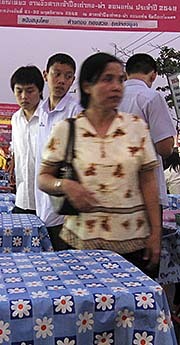 The town got a boost in the early 1960s, when general and then head-of-state Sarit Thanarat, who came from Isan, planned Khon Kaen to be Isan's inofficial capital. In 1964 the place got a highway connection (Thanon Mittraphap the 'friendship highway' or highway no. 2). to Bangkok, certainly payed by uncle Sam. When the Americans planned to attack Vietnam and the neighbouring countries Laos and Cambodia (see also: 'Bombs on Laos'), they built massive military air bases in Isan. Also Khon Kaen got a military airport in the 1960s.